Pre-Order now - Starts shipping in 4 weeks. The Grip LP is our basic Grip Leather case, but we stitched two contrast pieces using the best Argentinian leather before covering the Polycarbonate frame, resulting an iPhone 7 leather case thats light and slim, yet robust, plus it has that extra design touch, that makes it unique. The Grip LP is a Two-tone cabrio iPhone 7 Leather case with added Matt Black camera eyelet for better shots under low light conditions, our craftsmen took their time to build this case, they select and cut the perfect pieces of leather they sew the contrasting colors and then they stretch it over the Polycarbonate backbone, taking care not to wrinkle it, its a task that takes time and precision, but the result is a unique leather case. I got the case for my Wife for christmas and she loved it immediately. It is quite stylish but not flashy and the texture and quality of the leather make it quite nice to hold you phone while not being bulky. I’ve had case from Vaja before, one for an old iPod nano first generation that is still handsome and solid. So, Vaja cases probably last longer than the phones they protect. Great quality and looks ! My 3rd Vaja case, same leather and construction quality as always. Disappointing that the back doesn't firmly grip all 4 corners for safety. Top also leaves a gap that a flat lid would avoid. 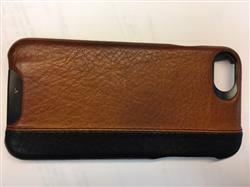 My best clamshell case from Vaja was the one for my iPhone 3s. Interesting rigid clip closure that securely held things closed without any magnets to mess up navigation and compass. Of course one is buying the cream a la cream of leather cases and although one cannot argue of the quality I just wished the case was a bit slimer. It is a little bit bulky for a nice slim such as the iphone7 and I found myself replacing the case quite often for a slim one. Excellent material and beautiful design. I like the fact that IPhone screen is protected by the cover borders when you put it on a table. These are cases for people who like to feel the luxury of warm fine leather, rather than cold, hard plastic, while using their phone. I decided to keep my iphone 6s another year, but I'm ok with it, due to my new, beautiful Vaja Grip LP case in Saddle Tan and Black. Patina coming along nicely already. Love it.